Choosing the best kids’ Halloween costume is always fun for both parents and kids, but it is important to remember some basic ideas when making or buying a costume. Halloween costume ideas can simplify this process, helping you to get that perfect, awesome, and adorable costume for your kid. Remember, whether your kid decides to be a superhero, fairy princess, or ninja, it is important to keep these kids costume ideas in mind. This is actually the best time in the year to buy Halloween costumes at low prices. Unfortunately, normal retailers have taken them off their shelves already. 1. Look for a good fit. One of the most important kids costume ideas is make sure that your kid perfectly fits in the costume. Never buy or make something that is too big or loose for your child. Costumes that are too long may sometimes cause your kid to trip and cause injuries. Try to avoid billowy and flowing costumes if your kid is not comfortable with them since they are likely to cause your kid trip if he or she is wearing them for the first time. Always remember to choose something that perfectly fits your kid. 2. Select flame-resistant materials. Make sure you select something that is made from flame resistant materials. This is because your kid may sometimes walk near lanterns, candles, or other decorative flames at Halloween parties or when trick-or-treating. By buying flame resistant Halloween costumes, you will definitely protect your child. 3. Let your kid choose his or her best outfit. Give your kid the opportunity to choose his or her Halloween costume. This will not only make the kid’s day, but also helps make sure that he or she gets something that he or she really wants Remember to assist your kid only if he or she has no ideas. Make sure you give your child a wide range of selections to choose from. 4. Use masks cautiously. This is an important one of the best kids costume ideas. Make sure you choose masks that perfectly fit your kid while allowing him or her to breathe comfortably. This keep everything fun as well as safe. You can easily create your own simple mask with some colored cardboard and a rubber band. 5. Use face paint labels. 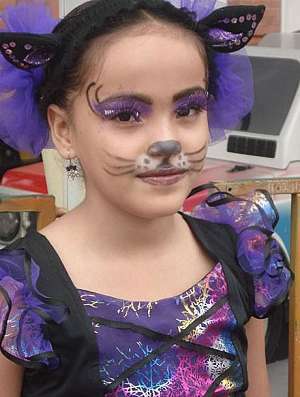 As an alternative , you can use face paint or Halloween makeup instead of using a mask. Make sure you choose paint that will make your kid look amazing. Some tips on making your own natural face paints here. 6. Choose accessories carefully. Make an informed decision about Halloween accessories. Accessories like swords or knives need to be soft and flexible. This will reduce injuries and keep the celebrations fun. 7. Choose safe footwear. This is a highly important point and one of the best ideas for Halloween costumes. This will protect your kid from hurting his or her feet. Make sure you do buy cheap plastic shoes that cause your child to slide and fall easily. With these Halloween safety tips and Halloween costume ideas, you will not only have an easier time making or buying the best Halloween costumes, but you’ll also make All Hallwos Eve more fun.